From Blob to Enduring Love of Velo: Hmmmm, it’s wet and cold outside, what should I do? Hmmmm, it’s wet and cold outside, what should I do? The obvious answer is of course, ride your bike! I managed to do this on both Saturday and Sunday, despite nasty sou-westerly winds whipping off Antarctica, constant drizzle or rain and generally freezing temperatures. You see the thing about riding in winter is that if you let the miserable conditions get the best of you there will be little or no bicycle riding fun. The key to winter riding is preparedness, and I’m not just talking about the correct attire (although this is probably the most important aspect). I’ve already regaled you with my cold weather commuting attire for frosty mornings (thanks Ground Effect). 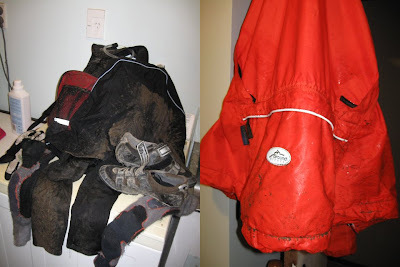 My “disgusting, wet, windy, cold” riding gear isn’t too different. I’ll start from the bottom up and keep it brief, thick knee high merino socks, under leg warms under either lycra shorts with my downhill (water resistant) shorts or my GE baggies. Both these options give you 3 layers of coverage on the thighs which is most welcome in the wet and cold. Bottom half sorted, top half can be a bit trickier depending on the riding you are doing. Saturday we headed to Bottlelake – land of uber puddles, for a high intensity singlespeed blast. I knew I’d be working hard and sheltered by the trees most of the time so I went for a long sleeved merino only under my She Shell with pit zips fully opened (and the water resistant downhill short combo). This worked perfectly. It was fairly wet, some showers interspersed with lovely Scottish mist (drizzle for those not of Celtic heritage) and the puddles were wide and in some cases much deeper than expected (crikey, my hubs seem to be under water!). We took off through the trees and headed towards the beach and on the way there I achieved a goal I’d set myself last weekend. I got all the way up the tip hill on my singlespeed. Yes. My first attempt a month ago saw me get a feeble third of the way up and last weekend I struggled three quarters of the way up. I was determined to conquer it on Saturday and managed to with much explosions of lungs and hauling on handle bars. It certainly wasn’t pretty, but I was happy once all the shiny stars went away. The rest of the ride was a hammerfest and by the end we were back in the carpark buggered and wet. My feet and lower legs were soaked most of the ride, but my feet didn’t get cold at all. This is the point in the ride where the extra preparations are important. Always take dry socks and shoes, or in my case woolly slippers, when you know you’ll be driving home with wet feet. Also a layer of dry wool will be greatly appreciated and your upholstery will thank you for the provision of a towel. I myself carry a very lovely Singapore Airlines purple and blue tartan knee rug which is great for wrapping around cold legs and keeping mud off the seats. On Saturday I was very happy to discover that once I removed my lovely Loeka shorts (as seen in this fabulous safety announcement) my bike shorts beneath were still dry. Another good idea is to start your car and crank the heater right up as soon as you arrive so that once you’ve loaded your bike, divested yourself of the wet, muddy clothes and applied dry warm clothes you can leap into a toasty vehicle and turn the demister on. Finally I discovered that leaving one’s spouse at home by the fire has the great benefit of being able to walk into a toasty warm house upon you’re arrival. These are the things that make winter riding bearable. Sunday was a slightly different kettle of fish. I actually wasn’t at all keen for a ride, the weather was worse and I was snuggled up on the couch when I received an “encouraging” text for a ride up Kennedy’s. Brrrrrrr. Oh well, I’ve always been a sucker for a bit of peer pressure. This ride would require more attention to detail for the top half of my body. The usual winter attire for the bottom half would be fine. The Kennedy’s ride would be exposed to the wind, however much of it would be climbing so it is more difficult to work out the optimal layering. I went for sleeveless but hi-necked merino under my GE long sleeved Starfish and topped off by the fantastic She-Shell. I also threw a long sleeved merino in my backpack just in case. The climb up the road was fantastic (who would have thought) and I was the perfect temperature by the time I got to the base of the 4wd track. This would have set me up well for the climb in the wind except I had to wait for the other mad buggers I was riding with and got ever so slightly chilled in the 15 minutes between my arrival and theirs. Up on the hill things got worse for me pretty quickly. The wind was howling into our faces as we climbed the wet paddock and my legs were complaining that I’d already hammered them the day before. Up the 4wd track and the little stream that had babbled to me on Thursday was bigger and more talkative and line selection was the key to keeping traction. We crested the rise and dropped down a bit into the lee of the windbreak and could actually talk. It was nasty, but there were other mad people out on the hill. We continued down and at the bottom met a lake at the stile and the wind returned. I was feeling pretty cold now and my legs were pretty much toast, but pig-headedness drove me on and up the next climb. It was bad. I was right in that black place you go when all you can do is turn your legs and keep your weight in the right place to keep going up. The wind was sucking the energy right out of me and my breath was coming in huge wheezing gasps. Not a pretty sight. Finally we made it to where it levelled off and I knew I was completely toasted. I really couldn’t go up into that wind anymore so I was extremely grateful when scatter gave me a get out of jail free card and I could bail. It felt sucky leaving everyone else on the hill to go up, but they are all significantly fitter than I am and I’d pushed all I could. It was then I made my big mistake for the day. If I hadn’t been so tired and focussed on getting down the hill I would have taken the time to quickly add my extra layer of wool under my jacket and zip up my pit-zips. But I didn’t and I froze on the descent in the howling wind. Having said that it was still pretty fun sliding down the hill in the mud. I was soon coated from head to foot in mud and at times had some difficulty seeing. I struggled lifting my bike over the fence in the wind and then remembered to zip up those pit zips. That helped a bit and I got a bit of warmth back climbing back up the 4wd, but then down the other side it was exposed and cold and I went down pretty slow as I just couldn’t keep the mud out of my eyes. The fast trip down the road left me struggling to get my legs moving at the bottom, but did clean most of the mud off my face as sheets of water sprayed into my eyes. Yuck. I got home in a bit of a state, but managed to take the time to clean my mud coated bike and apply lashings of lube to my freshly cleaned chain. All the while my lovely husband ran me a bath and then helped me remove my mud crusted layers as my hands and brain weren’t really talking to each other. After a soak I returned to semi-human but was completely wasted energy wise. Both were great rides and I’m really glad I got out and did them. Hopefully both will pay dividends on Wednesday for the night race.